Despite a lengthy hiatus from the director’s char, director CHUNG Ji-young is without a doubt one of the major figures in the Korean film industry. Starting off as an assistant director for the legendary filmmaker KIM Soo-yong (Mist, 1967; Night Journey, 1977), he spent the majority of the 1980s directing melodramatic fare before moving on to more politically-charged works following the end of the CHUN Doo-hwan administration. Some of his most famous films include North Korean Partisan in South Korea (1990), White Badge (1992), and Life of the Hollywood Kid (1994). However, his influence on the industry extended far beyond his filmography, as he was also a fierce advocate for governmental reform, particularly as it affected the Korean film industry. As a leading voice in the filmmaking community, he argued for the establishment of a screen quota system among other issues confronting the industry at the time. However, following Naked Being (1998), he took an extended hiatus that finally ended last year when he returned with Unbowed at the Busan International Film Festival, a film that caused a sensation subsequent to its commercial release in January of this year. 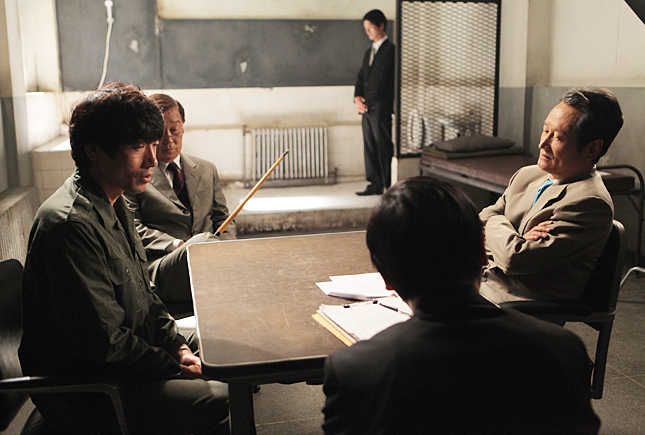 Following its enormous acclaim and unexpected box office success, CHUNG came back to Busan this year with National Security, an uncompromising film depicting the horrific torture that was carried out within the walls of Room 515 in the anti-communism division of the National Police Headquarters in Seoul’s Namyeong neighborhood circa 1985 (from which the film’s Korean title Namyeong-dong 1985 is derived). Boldly opting to spend 90% of its running time on the waterboarding and other acts of torture inflicted on activist KIM Geun-tae, who subsequently became Korea’s Minister of Health and Welfare, CHUNG’s new film is without doubt a challenging one. By the director’s own admission, he found it difficult to shoot some of the film’s most trying scenes. Though perhaps none had a harder time than actor PARK Won-sang in the lead role, who overcame a fear of water for his devastating performance. Though many have reacted strongly to the film, some even choosing to leave theaters during its screenings at Busan, National Security achieves exactly what it sets out to do. Some younger Koreans are not fully aware of their own history and CHUNG hopes this film will be a reminder of the sacrifices that some endured in order for Korea to progress to its present state. The film’s November 22nd release date, only a short while before the next Korean presidential election, is also no mere coincidence. While a difficult film about an extremely sensitive subject, CHUNG has once again shown himself adept at using expert pacing as well as performing a delicate balancing act to keep his narrative away from the brink of exploitation. Bleak and grueling as its tale may be, National Security is a potent and perhaps necessary reminder of Korea’s haunted past.